A bid to create Europe's largest area of protected night sky has now been lodged with a global organisation campaigning to keep the world's skies dark. 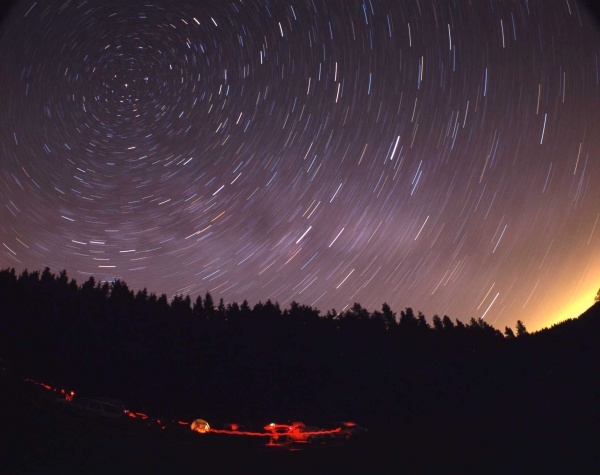 The move to designate nearly 1500 square kilometres of Northumberland as England's first Dark Sky Park is being considered by the International Dark Skies Association (IDA) based in Tucson, USA. A decision is expected before Christmas. Kielder Water & Forest Park Development Trust, Northumberland National Park Authority and Kielder Observatory Astronomical Society have been working on the bold plan for two years. Widespread support has come from residents, local councils, businesses, tourism agencies, wildlife campaigners and scientific organisations, including Jodrell Bank and the Royal Observatory at Greenwich. 1. More than 300 light meter readings have been taken underlining that Northumberland has the largest expanse of truly dark night skies remaining in England. 2. Kielder Observatory has shared the wonders of the Universe with over 43,000 visitors since it opened in 2008 and further growth is forecast. 3. A unified Lighting Master Plan has been endorsed by the Northumberland County Council and the Northumberland National Park Authority to protect our night sky from wasteful light pollution in future years. 4. A lighting audit reveals that 75% of external lighting within the proposed Northumberland Dark Sky Park complies with IDA guidelines – the bid includes plans to improve this still further. 5. Forestry Commission, Northumbrian Water and Greenhaugh village are just a few of the places and organisations already making changes to their lighting to enhance the dark skies within the proposed Dark Sky Park area. 6. Local businesses are working to develop new astro-tourism activities. Some have already run stargazing packages and more business training seminars funded through the programme are planned. 7. Northumberland County Council's street light replacement programme will make a significant contribution in protecting the night sky through the use of more energy efficient and fully shielded lights. Maintenance costs will also be slashed by 60%. 8. More Dark Sky Discovery locations will be created in the Dark Sky Park where people can enjoy stargazing. 2 Kielder Water & Forest Park Development Trust is a registered charity working to develop the Park as an inspirational place. It aims to improve economic, social and environmental sustainability, provide public recreation and leisure facilities, facilitate education in all aspects of the natural environment and advance art and architecture in the Park. The Trust works with the range of communities to benefit from these activities. Members, who have appointed directors/trustees to serve on the board, are Northumbrian Water, Forestry Commission, Calvert Trust Kielder and Northumberland County Council. Affiliate organisations that are not members but have a close working relationship with KWFPDT include Arts Council England, Northumberland Wildlife Trust, Environment Agency, The Scout Association and local decision making bodies such as the parish councils. 3. Northumberland National Park encompasses the landscape and cultural heritage of 405 square miles (105,000 hectares) - over a fifth of Northumberland from Hadrian’s Wall to the Scottish border, and adjoins Kielder Water & Forest Park along its western boundary. With the help of our dedicated volunteers the National Park Authority looks after more than 1100 kms of Rights of Way - including two national trails and a number of long distance walking, cycling and horse riding trails, and the central, most visited section of Hadrian’s Wall World Heritage Site. 32 Sites of Special Scientific Interest covering over 10,000 hectares, one Ramsar Site; three National Nature Reserves and 6 European Special Areas of Conservation fall within the boundary of the National Park. We are also home to one of the country’s official Dark Sky Discovery Sites (Cawfields) and are part of the Northern Upland Chain Local Nature Partnership. We work with farmers and landowners to maintain healthy soils, clean water and dark skies, to enhance wildlife habitats and help rural businesses adapt to climate change. We are supporting sustainable enterprises, transport and green tourism and encouraging domestic and community-scale renewable energy. We have also invested in a network of electric vehicle charging points at keys places in the National Park and along Hadrian’s Wall as part of a network installed around the North East. www.northumberlandnationalpark.org.uk.